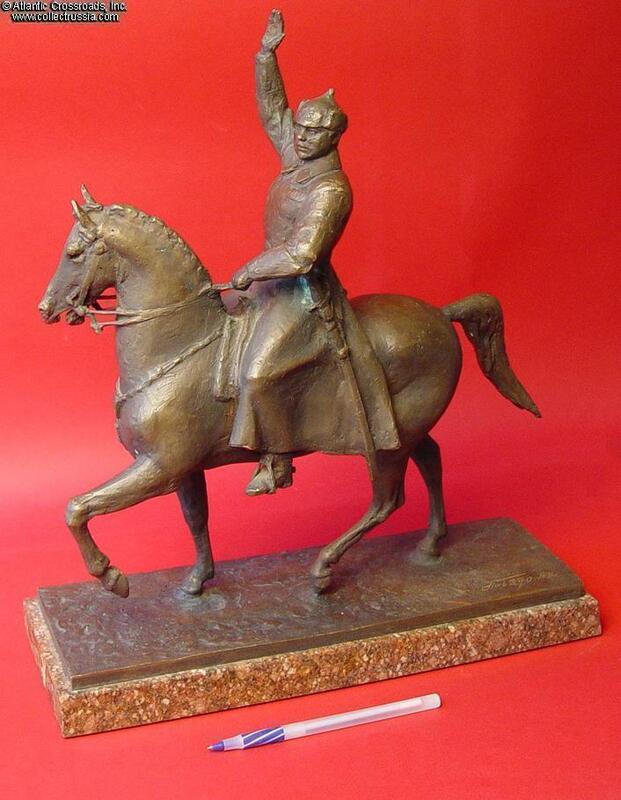 Equestrian Sculpture, cast bronze on marble, showing, Marshal Kliment Voroshilov as an outstanding Red Army cavalry leader saluting his troops at the apex of his career. 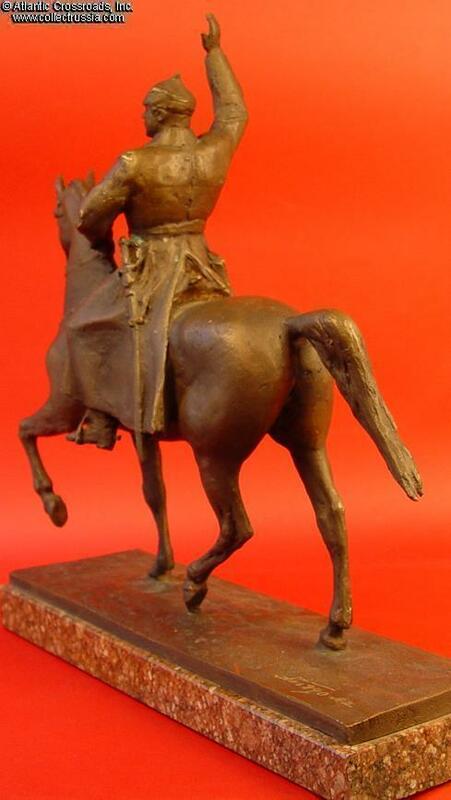 This exceptional work of Soviet political sculpture art is rendered in large scale and high quality and is probably one of only a handful of castings which intended for important officials or institutions. 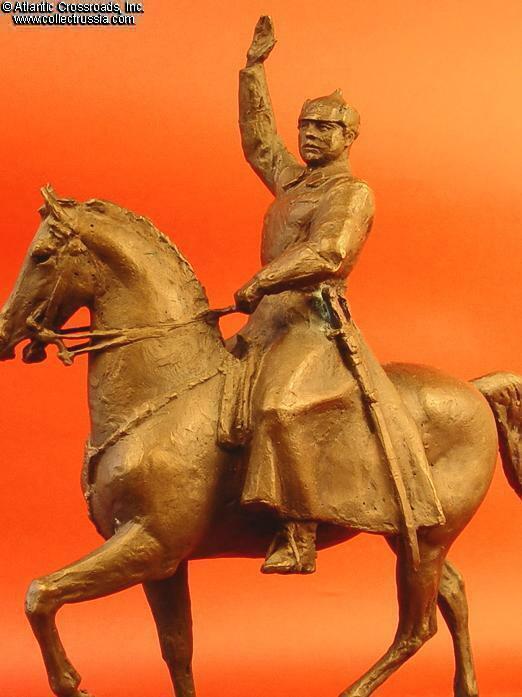 An excellent likeness, this sculpture is a rendering of the 12 meter tall national monument to Voroshilov in Lugansk, his birthplace. Measures 15" tall by 14" tall x 4.5" wide and weighs approximately 20 lbs (please note that special shipping charges may apply due to size and weight.) This is an excellent size for a collection centerpiece or a commanding room ornament. Voroshilov was perhaps the ultimate Soviet: revolutionary, solider, commander, politician, Stalin confidant, and a survivor who enjoyed a peculiar longevity within the "inner circle." A Bolshevik from 1903 on, Voroshilov was an active revolutionary prior to the Russian Revolution of 1917 and an outstanding Red Army commander in the civil war. 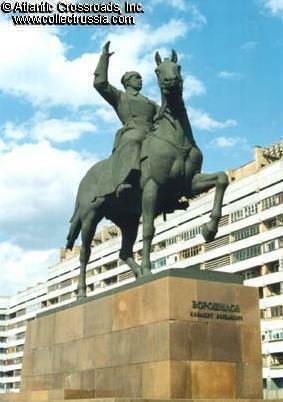 As commissar for military and naval affairs, later defense, Voroshilov helped reorganize the Red Army. 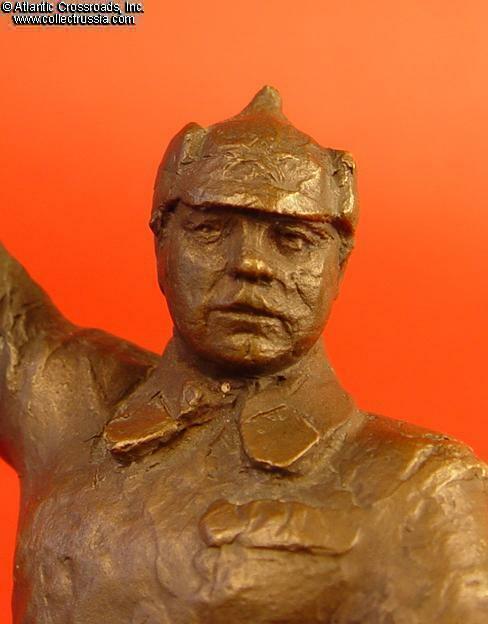 In World War II he served as commander of the northwestern front and at one point in the early phases of Operation Barbarossa, he is said to have personally led a counter attack with his pistol. Although his critically important defense of Leningrad failed to prevent encirclement, he managed to retain Stalin's favor. And while his strategic skill proved ineffectual in fighting mechanized warfare against Germans, a series of KV tank was named after him. 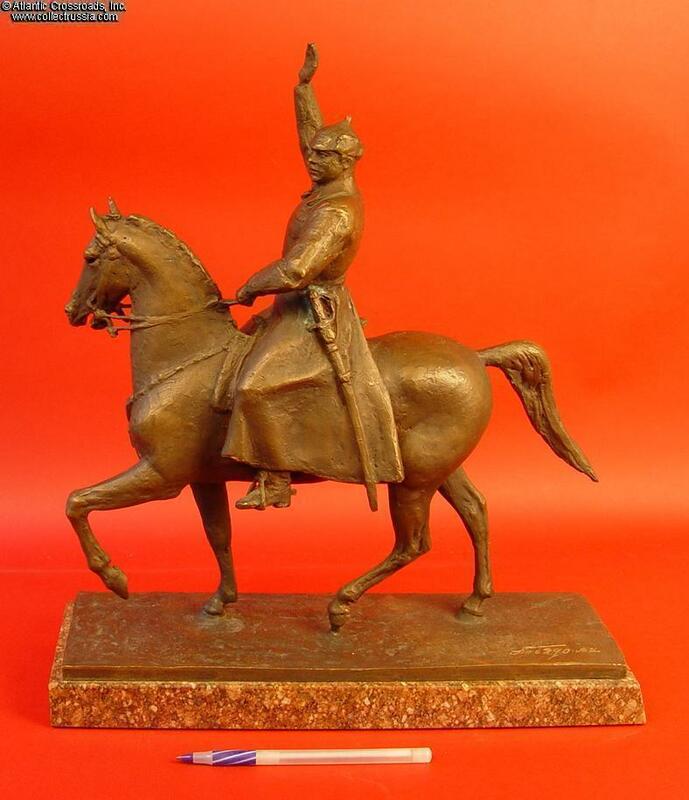 This magnificent statue probably dates to the early 1980s, and is in excellent condition. Around the horse's front right hoof, there is a slight hairline crack to the ground. Otherwise solid, with no other cracking present, and no wobble. There are a few small greenish oxidation spots, some at the front right leg where it meets the body, also a small amount of spots on the greatcoat in this area and above the sword hilt. 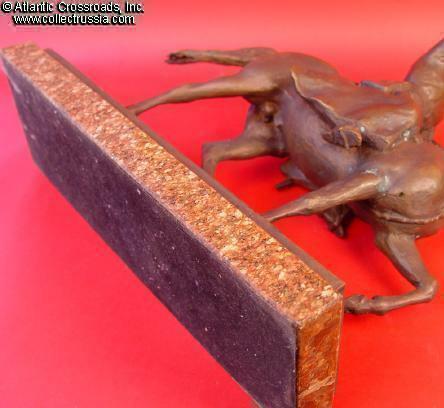 Genuine polished marble base is brown / pink hues, which may be same or similar as used in Lenin's tomb. There are some very minor chips to the lower edge of the marble base at the rear. Bottom is covered in felt. 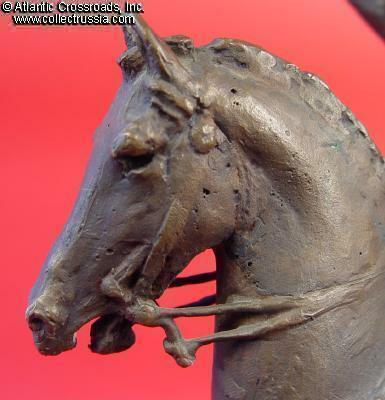 Name of artist or metalsmith or possibly the original owner "Posyado A. I." inscribed by hand into the bronze base. 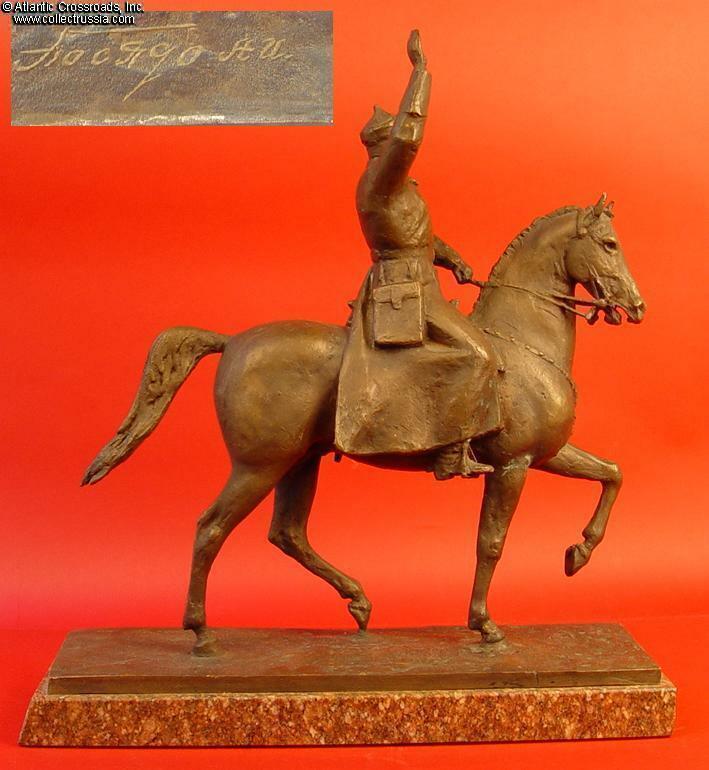 All in all, a highly impressive piece of bronze statuary of an important historical figure, perfectly suited for the most advanced Soviet collection.